Whopper's Bunker: Are you depressed? Suicidal? Then don't go to the flicks! Are you depressed? Suicidal? Then don't go to the flicks! Zombieland painted a desolate canvas for the future of humanity when it wasn't being hilariously funny. The world's elite were saved in a few man-made arks at the end of 2012 leaving the rest of the world to drown. Human civilisation is all but vanquished by vampires in Daybreakers. A scant few humans remain in The Road - including the ones who now live to eat babies and bugger each other. Alas, movies like Star Trek to offset misery are so few and far between; it's no wonder that people are falling into depression after seeing Avatar and realising their real world is not a cool as the one Cameron crafted. 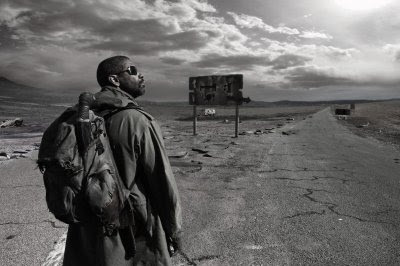 I was going to give The Book Of Eli a review, but I've decided against it. I will just say it's a 4-Star movie with excellent action sequences involving automatic weapons and explosives and brawls involving edged weapons with superb dismemberment, if not enough blood. It's beautifully judged and shot by The Hughes Brothers and features a striking, almost Vangelis-like score from Attacus Ross. These elements coupled with superb acting as always from Denzel Washington, a wonderfully crafted character from Gary Oldman and the obligatory bit of fluff in the delectable form of Mila Kunis has destined the Blu-Ray to become one with my shelf. It's just the fact that it's hard to justify some of it's story elements in a coherent fashion to you is what it preventing me from writing about it. ...and what about the buggery??? ?.....what...there's NO BUGGERY????? I'll sit this one out I think in favour of the directors cut of Deliverence. I'm depressed that everytime I check this blog, there's nothing new. Which computer game huzzie are you cheating on us with this time Colonel? Damn you for getting there first! I was just about to reveal to the world your moe relationship with Lelianatan. oh Civvy, you know how it is. Those 2D girls always trying to compete with us 3D girls...they can only wish.